While you may be ready for summer, your deck and patio furniture might not be. Before you can spend evenings enjoying cookouts, bonfires and s’mores on your patio or deck, it is important to prepare the furniture for the season ahead. In this post, you will find tips for getting your outdoor deck and patio furniture in shape for the summer. Condition Wooden Furniture: Conditioning your wooden furniture will help to weatherproof it against sun and rain damage. Sun and rain damage can cause the wooden furniture to rot or gray. If you live in an especially sunny location like Florida or California, it may be smart to also apply a UV blocking sealant. 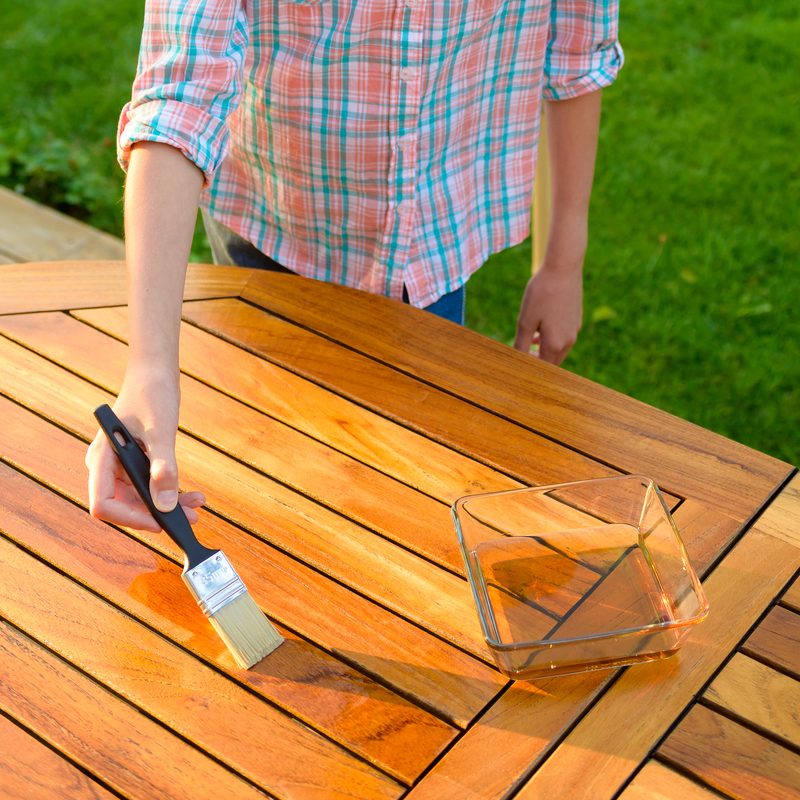 Consider Re-Staining Outdoor Furniture: If the furniture suffered some damage last summer, it may be necessary to completely re-sand and re-seal it. After the wooden furniture has been re-sanded and resealed, apply a wax coat to protect the finish against the summer elements. Tighten Screws and Bolts: Avoid having a potentially dangerous mishap by checking your table and chairs for loose screws and bolts before putting them out for the summer. Be sure to not overtighten the bolts and screws because that can lead to structural damage. While furniture cushions are typically made from fabrics that can withstand a great deal the elements and sun, it is still smart to clean them before each summer season. Dust the Cushions: Dust the cushions with a soft bristled brush to remove any dust, dirt or pollen. Spot Clean the Cushions When Needed: If the cushions suffered from BBQ or campfire stains, spot clean them by creating a solution of borax, dishwashing detergent and water. Dust Your Umbrella: No one wants to open their umbrella their first time using their patio furniture and be showered with dust. Use a thin bristled brush to dust the umbrella and remove and dust or dirt that may be stuck. Spot Clean When Needed: If your umbrella has spots of mold or stains, remove it by creating a solution of dish soap and water. When your patio and deck furniture are not in use, consider storing them in a storage unit. A climate controlled storage unit rental with Lighthouse Self Storage will protect your furniture from any dangerous fluctuations in temperature and humidity. Lighthouse Self Storage has storage facilities located in Carson, CA, Fort Lauderdale, FL, Westminster, CA and West Palm Beach, FL. Our 5×10 storage unit would be ideal for storing patio furniture, chairs and an umbrella. While our 10×10 storage unit would fit patio furniture, outdoor basketball hoops, lawn mowers and more. Contact us to rent a storage unit today!